As the premier family dentistry practice in Ahwatukee, Shine Dental Arts often uses dental sealants to help reduce cavities in our youngest patients through their teenage years. 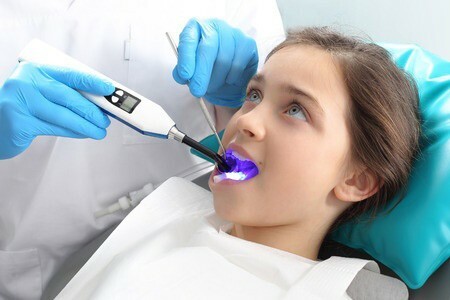 Our dentists have professional experience in pediatric dental offices, so we are well versed in how to ensure your child enjoys a positive, informative experience at their next appointment. For kids who require sedation in order to allow the doctor to perform dental work, Shine Dental Arts partners with the best Ahwatukee pediatric dental offices to ensure our child patients receive the best in treatment. Dental sealants are thin coatings the dentist can use to fill in the grooves and pits of a tooth, all of which can be home to unpleasant bacteria. The dentist applies sealants to the healthy chewing surfaces of the teeth in order to prevent decay and cavities. This is an especially effective treatment for children. The Centers for Disease Control reports that tooth decay already affects over half of kids aged 6 through 8 (and an even larger number of older children and adolescents). Because sealants prevent decay, they also save on costs often associated with filling cavities. Many Ahwatukee parents choose sealants for their children because it is a more affordable and less invasive procedure that prevents cavities. Sealants are white or transparent, which renders them virtually invisible when patients talk, smile or eat. Dental sealants cover approximately 90 percent of the tooth and are 100 percent effective when properly applied. How do I know if dental sealants from your Ahwatukee family dentist are right for my child? Sealants may be the right choice for your child if he or she has healthy molar teeth without observable decay. Schedule a consultation with Shine Dental Arts for a complete examination, which can help you determine if dental sealants are the right preventative health solution for your little one. What should I expect when my child gets dental sealants from my Ahwatukee family dental office? Placing dental sealants is a pain-free procedure. It includes no drilling, so the entire tooth will be left intact. The dentist will thoroughly clean and treat the tooth with a special gel before he or she paints the sealant on and cures it. Although your child may feel the sealants on his or her teeth at first, they are very thin and easily forgotten. Are there any special care instructions to follow after the sealants are placed by my Ahwatukee Family Dentist? Patients can return to normal eating habits after the dentist applies the dental sealant, although they should regularly be checked during visits to the dentist. Damaged or stripped sealants can also be replaced. If you still have questions about whether Sealants are right for you. Give us a call or fill out our contact form to book an appointment. We’re here to help!